Once you start using your smart ball there are a few things you can do to get more out of your practice. These tips came mostly from conversations I’ve had with parents who’s players have started training with the smart ball. Whether you got Dribble Up on Amazon or on this site, these tips can help with some of the questions you might have about training with the soccer ball. Since it’s winter and many of us are training indoors this can be a useful tip. When you use Dribble Up make sure you setup in a space with good lighting and that doesn’t have a bright light source in the background. We’ve had issues with both of these, when we first started trying out DribbleUp in our living room we had a lamp right in the middle of the background. Often times when we’d scan our ball the cones would start off red and we’d know right away the tracking was off. We had to re-scan several times to get green cones until we talked to the team at DribbleUp and learned to remove the light source from the background. We also tried using Dribble Up in our unfinished basement which is dimly lit. It’s kind of chilly in the winter but has great cement walls for doing wall work with the Techne app my daughter uses. When we used Dribble Up in the dim light the ball tracking wasn’t perfect so we moved upstairs and it was much better. If you’re doing a new playlist or one that has drills you haven’t done before it’s a good idea to watch the videos before starting the playlist. The Dribble Up app does show you a clip of the drill as you go through the playlist. If it’s a simple one then it’s easy to pickup but as you start working on the more complex drills its nice to be able to watch them a few times before tackling it in the middle of the playlist. Each drill has a little blue camera icon next to it, if you tap it you can watch the Dribble Up video of the trainer explaining the drill and then demonstrating it. Once he’s done you can tap the video to play the demonstration again, you can watch it a few times until it makes sense. 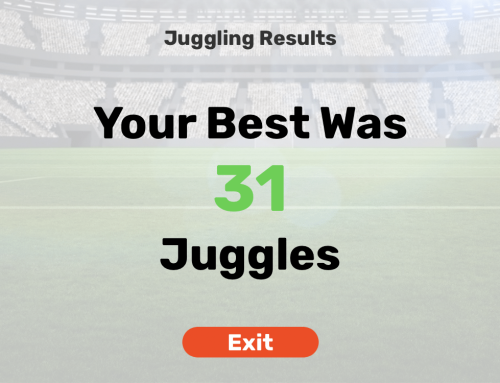 One of the things we mentioned in our early Dribble up reviews was the need for different level of players to be able to use the app and stay motivated. It was kind of discouraging for less developed players to get low scores so we were really glad when they added the ability to select a difficulty level. So now that there’s an option the question is which level should a player use to train? The best way to figure it out is to try the same playlist on different difficulty levels. Start off doing the playlist on the easy setting and then do it again on the medium setting. You can go back and look in the Progress tile to see a history of your drills. If you aced the easy playlist then you’re obviously ready for the medium setting. If you struggled on some of the drills on the higher setting, that shows you what things to work on in the lower setting. Dribble Up has added a new feature that I like but may confuse players who are already accustomed to the app. As you know each playlist is made up of drills and after one completes the next begins. 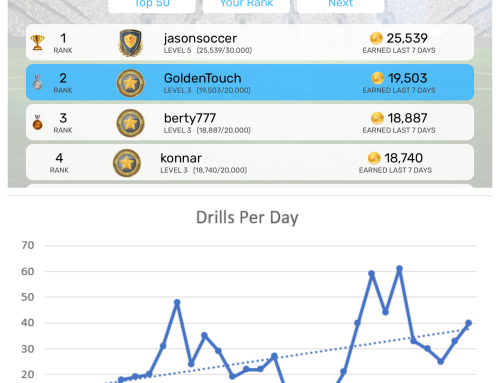 Now the DribbleUp app starts beeping during the last few seconds of a drill to let you know when you can stop. I think it’s a good new feature but my kids stop as soon as they hear the beeping which messes up their score. So if you’re not used to the warning beep, when you hear it – keep going. I think it’d be nice if they added some audio signal when the drill starts as well, what you do think? As you know good dribblers lose their mark with fakes and changes in direction. You’ll practice a lot of changes of direction when you go through the Dribble Up playlist and as you’ve probably experienced there are times when you might lose control of the ball and have it roll away. If you’re training out on an open turf field that’s not a big deal. But many folks use DribbleUp in their living rooms, basement, garage, etc. To prevent you chasing the ball all over while the drill runs or having your smart ball get stuck under a chair you can simply put down some bumpers to keep the ball contained if you lose control. The easiest thing we’ve found that works pretty well is throw some couch pillows down if you’re in the living room. In the garage or basement we’ve used storage bins on either side of us, whatever is handy! Dribble Up has a coaches dashboard where coaches can assign homework and see which players have been putting in extra work. Primarily I’ve been using it just to assign playlists for the weak foot to get players working on their non-dominant foot over the winter. As the app evolves I think more and more coaches will use the custom playlist functionality to assign work outside of training sessions. If you’ve ever been in a huddle at the end or beginning of practice when the coach asks who’s been working on foot skills outside of practice you can probably relate. You can’t fool the smart ball into thinking you did a workout. It’s a great way for a coach to see which players are putting in the work outside of training. In addition to being useful for coaches it’s also a good way to maintain healthy competition within a squad. When players are added to a team they get their own Leaderboard – in addition to the DribbleUp FC leaderboard. 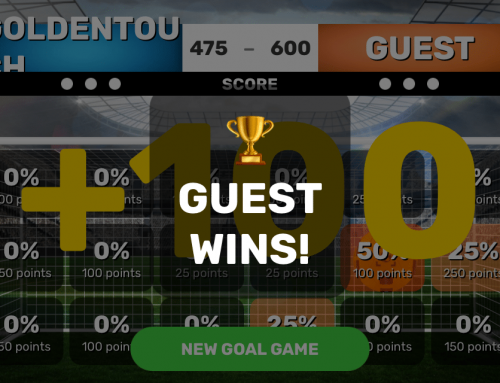 So they can see what level their teammates are on – for some players that’s the little extra motivation they need to login every day to make sure they’re keeping up with their team. 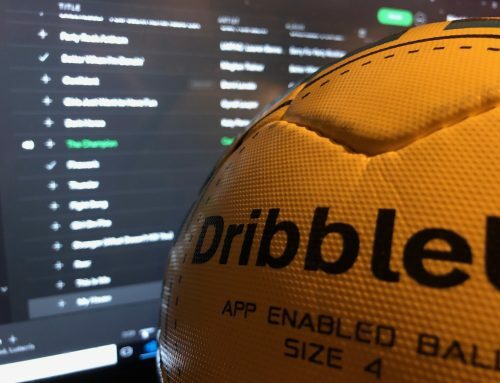 If you have other players on your team who might be interested in training with Dribble Up and competing against their teammates let me know and we’ll work on getting them a ball.